Though a small country by land area, Belize is amazingly diverse. Covered with mountain ranges, lowlands, and coastline on the Caribbean Sea, it’s a favorite location of eco-tourists and adventure seekers who like to get dirty, burn lots of calories, and forget about the stress and chaos of their everyday lives. It’s home to an amazing number of waterfalls too, most of which are conveniently located inside the country’s many national parks. 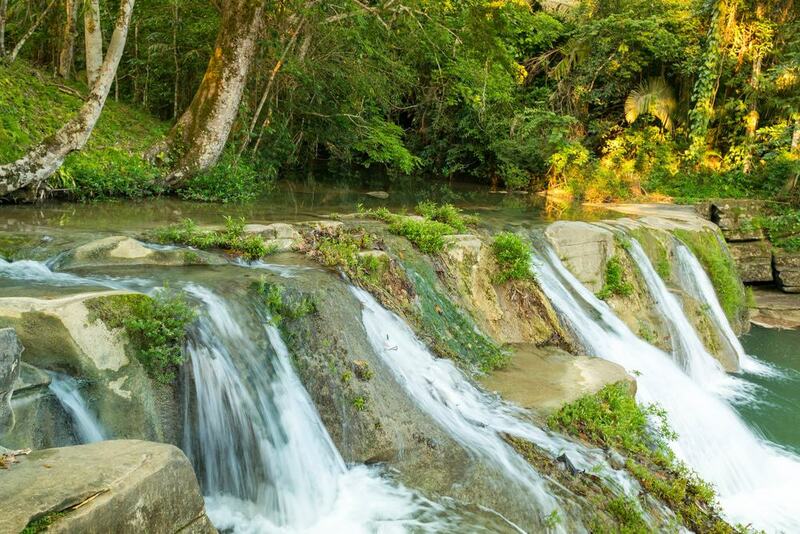 Below are 15 of the most amazing waterfalls in Belize. Most of Belize’s waterfalls are located in state parks, and Antelope Falls in Mayflower Bocawina State Park is no exception. At nearly 1,000 feet tall, it’s one of the country’s tallest falls. 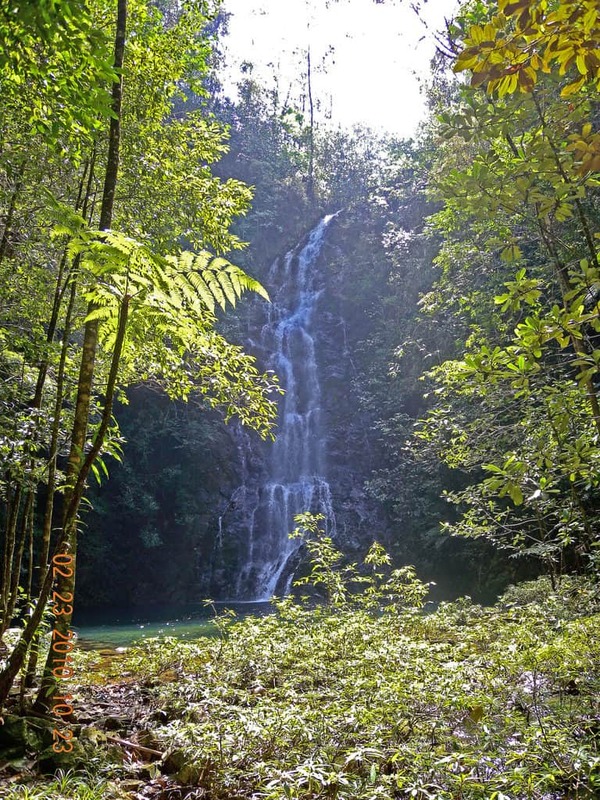 The hike to Antelope Falls is more difficult than many others, but the panoramic views of the surrounding rainforest and the Caribbean Sea from the fall’s crest will be well worth it. There is an upper and lower portion to the falls, the latter being the easiest to reach. The park offers guided bird-watching, zip-lining, and hiking tours to ancient Mayan ruins, too. At nearly 500 feet tall, Davis Falls are said to be the second-largest in the country. Like a lot of other falls on the list, they’re located in the Stann Creek area, which puts them in close proximity to amazing beaches, ancient ruins, and a host of other tourist sites. The falls are located just off the Hummingbird Highway near the town of Dangrea, and there’s a fee to enter. Due to their remote location, one of the favorite methods of seeing them is by guided ATV tour. At nearly 1,600 feet, The Thousand Foot Falls are a bit misnamed, perhaps by some selfish waterfall aficionado who wanted to dissuade others from visiting. They are the tallest falls in the country — and the whole of Central America — and due to their sheer size, the falls can be seen from afar, especially when driving through the valley below. Their location in the Mountain Pine Ridge Forest Reserve makes them a great trip to piggy-back with the area’s other natural and historical sites. Though the hike in is long and moderately difficult, you’ll be amply rewarded for your effort. 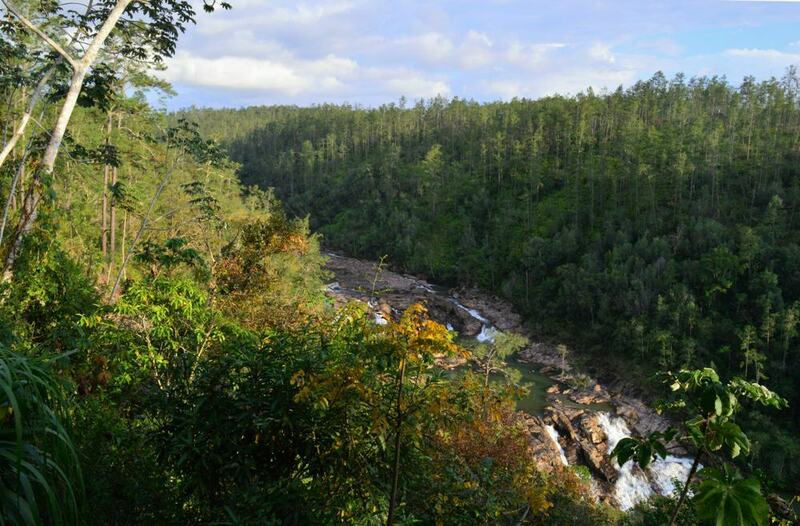 At nearly 150 feet, Big Rock Falls in the Mountain Pine Ridge Forest Preserve are among the largest falls in Belize. Due to the rock over which the falls flow, the water is tapered into a V shape, giving the falls a truly unique look. Though the surrounding rocks may look climbable, be careful; they can be slippery. Although the water doesn’t look too forceful, it packs a lot of punch. The pool below is easily accessible and a great place for a family swim and picnic. The Bocawina Falls are found inside the Mayflower Bocawina National Park, which — in addition to its stunning waterfalls — is home to an amazing number of bird species, Mayan ruins, and a zip-line that’s purported to be the longest in the entire country. At nearly 100 feet tall, the falls are impressive and picturesque. Due to their hidden location in the surrounding forest, they are best reached with a guide. The pools below the falls are a great place for a swim or picnic and repelling and climbing are available if you’d like to get your heart rate up. If bird watching is your thing, don’t forget your binoculars. 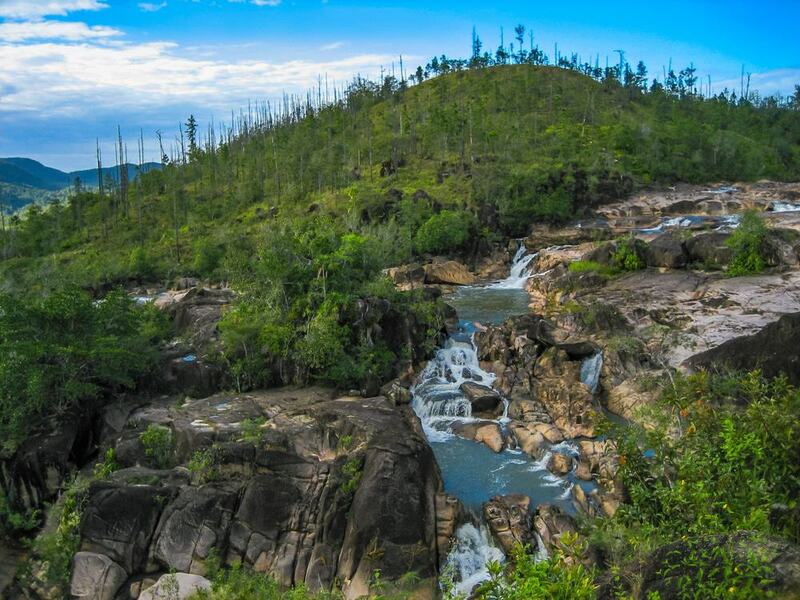 Located in Belize’s south-central portion, Butterfly Falls are on the border of the Mountain Pine Ridge Forest Reserve, which is nearly 100,000 acres of protected pine forest. Though near the forest reserve, the falls are actually on private property and are only accessible by guests of Hidden Valley Inn. Guided tours are available; the 30-minute hike can be difficult in places, especially after rain. The water above the emerald green pool falls nearly 80 feet from the fall’s crest, contrasting with the rock face and lush jungle surrounding it. 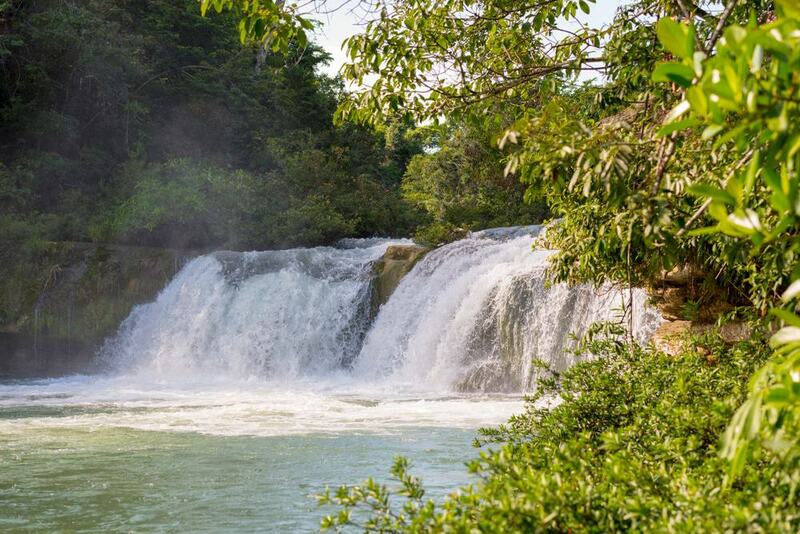 Near the quaint fishing town of Placencia on Belize’s southeast Caribbean coast, the Maya King Waterfalls are perfectly located for those who want to experience the country’s eco-related activities like hiking, climbing, and snorkeling. At about 70 feet high, the fall’s water drops from the forest above and splashes to the scenic pool filled with refreshing water at its base. The falls are on private property and there is a small fee to enjoy them. It’s best to go with a tour guide; the cost will include transportation, entrance fees, and the guide’s fee too. Located in Cockscomb Basin Wildlife Sanctuary is Tiger Fern Waterfall. The hike from the park headquarters to the falls is about four kilometers. Depending on your physical ability, it should take no more than a few hours round trip. The park employees will give you an overview of the various trails in the area; if you’re comfortable with the layout, you’re more than welcome to head out on your own. Keep an eye out for the exotic plants and animals that call the park home. Many of them aren’t found anywhere else. 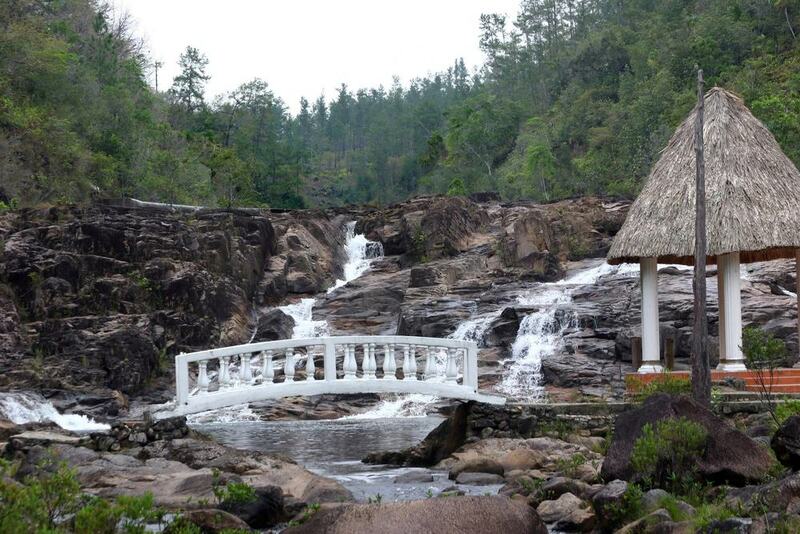 Located near the central Belize town of Sarawina, Five Sisters Falls is a popular attraction to visitors heading to the Mountain Pine Ridge Forest Reserve. Named after the five individual portions that make up the falls, Five Sisters is noted for its enticingly clear pools and gleaming falls set against the dense green forest nearby. The falls are near to lodging and restaurants if you’d like to spend the evening in luxury after a tough day of slashing your way through the jungle. The falls and viewing areas are easily reachable from the park office and resort. 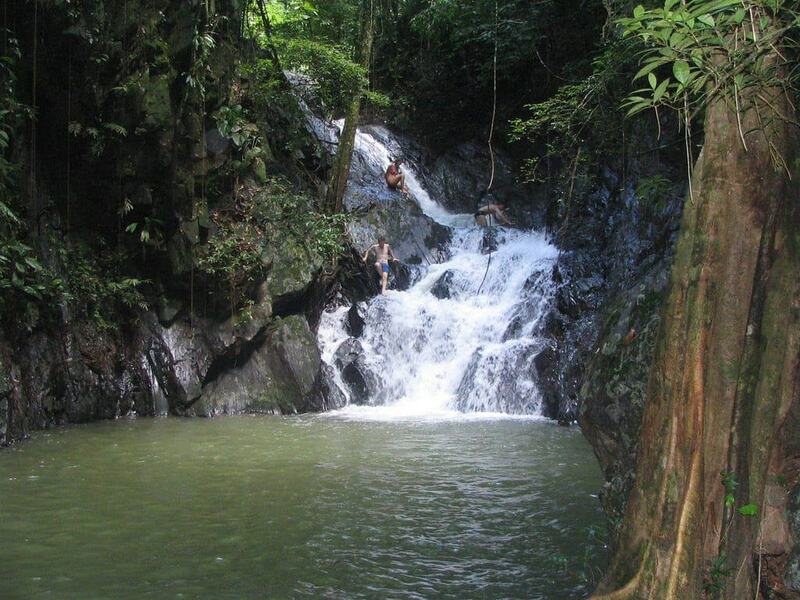 Located in the Cockscomb Basin Wildlife Sanctuary, Ben’s Bluff Waterfall is another must-see waterfall in Belize’s Stann Creek area. The park’s land has been set aside to protect the area’s plants and animals — in particular, the jaguars — or panthers — that are native to the area, but whose numbers have been dwindling due to a loss of suitable habitat. The moderately difficult trail winds its way about 4 ½ kilometers through the park to the falls. Though it can be tricky in spots, it’s suitable for most visitors. Though not tall by waterfall standards, the falls are beautiful and well worth the effort to get to them. Be especially careful in the early morning or late afternoon, as these are the times jaguars prefer to prey on unsuspecting tourists. 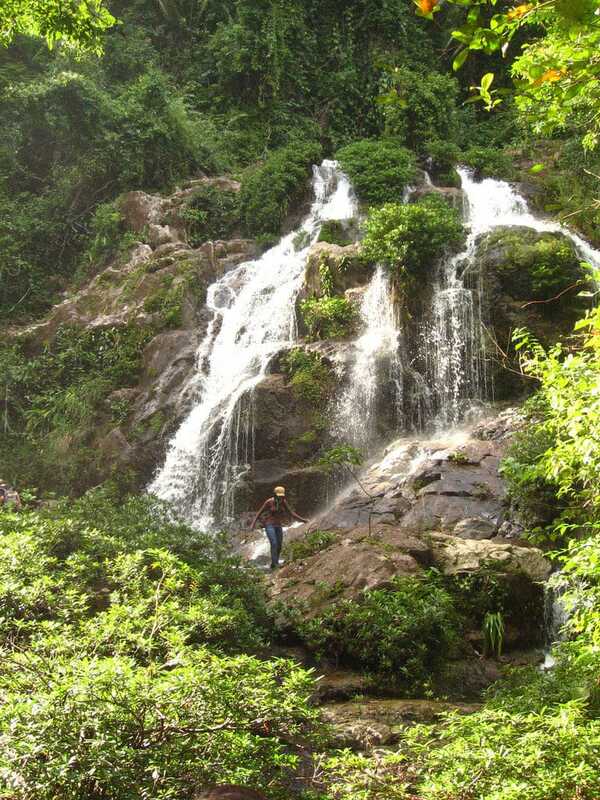 Located inside a 500-acre protected area, the Rio Blanco Waterfall in San Antonio is part of an area set aside for the local indigenous people. In part, they support themselves from revenue from the falls, so there’s a fee to enter. The mile-long trail is accessible by car or on foot, but it’s best not to drive because — depending on the season — the trail can be narrow and slick. At just about 20 feet, the falls make up for in beauty what they lack in size. Don’t forget a bathing suit and bug spray, and don’t be surprised if you see some of the natives enjoying the falls and swimming hole too. 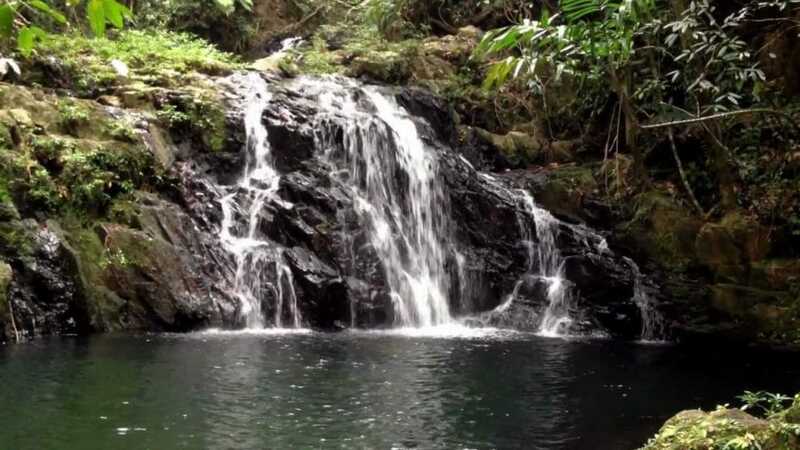 Located in a national park with the same name, Billy Barquedier falls are conveniently located in the country’s popular Stann Creek area, which makes them a great place to see in an easy day trip. There’s a fee to enter the park, and the falls are about half an hour from the parking area. The trail can be difficult in areas, including portions over slippery stone and up muddy embankments, so be careful. The falls aren’t large, but they seem to emerge from a dark hole in the surrounding jungle, and the pool below is a great place for a refreshing swim. If, like me, you thought that a waterfall that barely reached 10 feet wasn’t exactly a must-see in a country with so many noteworthy sites, guess again. Near the small town of San Antonio, the small but scenic falls sport easily accessible pools above and below; each are perfect places to take a dip and wash away that sweat and grime. The pool’s water is shallow, and if it hasn’t rained recently, clear too, which makes them easy to wade across and check out some of the things that live inside. The falls are a stone’s throw from the road leading out of town and are a great stop, even if just for an hour or two. 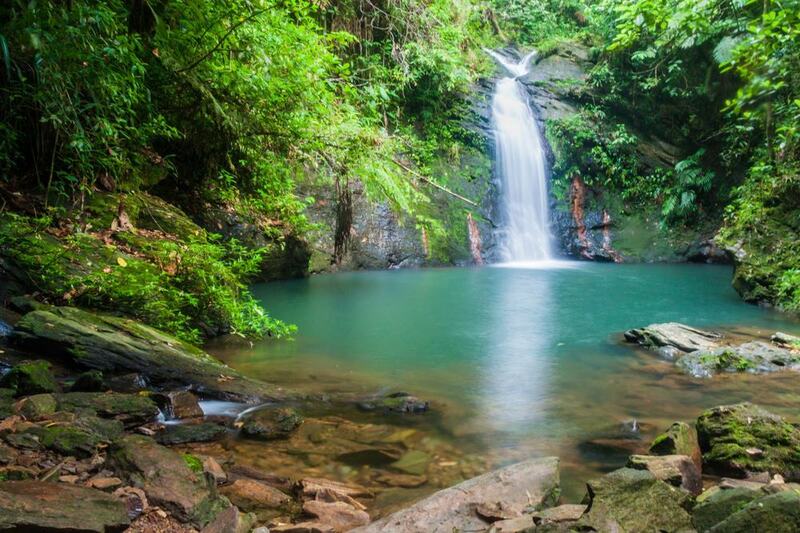 Another small but tranquil and beautiful waterfall is the Golden Stream Waterfall, located near a town of the same name in southern Belize. On the main road outside the town on the Southern Highway, you’ll know you’re near the trailhead when you see a blue-roofed hut that sells trinkets to tourists. The waterfall isn’t visible from the road because it’s behind a row of trees, but if you follow the path near the hut, you’ll get there in no time. The falls are a place where the villagers come to wash clothes. The water is usually clear unless it’s rained recently. The pools above and below the falls are suitable for swimming, and you’ll probably have the pleasure of sharing them with some village youngsters. Located near Cayo, in Belize’s western interior, Rio on Pools and the surrounding falls are often referred to as Belize’s most alluring swimming pool. Like a lot of waterfalls, they’re located inside the Mountain Pine Ridge Forest Reserve. Although they are waterfalls, they’re really a series of natural pools set along a slow-moving river strewn with large, round boulders. Despite their out of the way location, the falls and pools can get busy, but even so, with so many pools, you probably won’t have much trouble finding a spot that isn’t overcrowded.